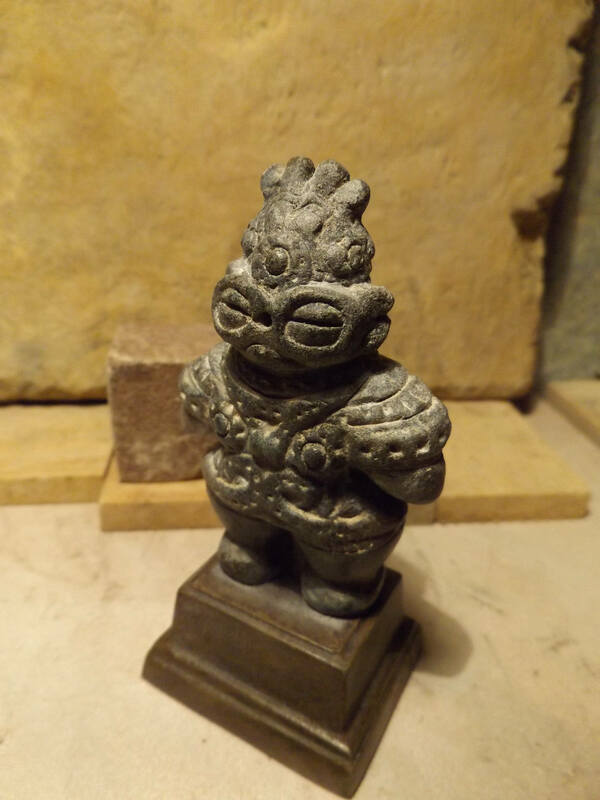 This is a replica of an ancient Japanese Dogu statue which were prominent during the Jomon period (14,000 - 300 bce). Earliest examples are crude forms comparable to the so called 'Venus statues' of neolithic Europe. 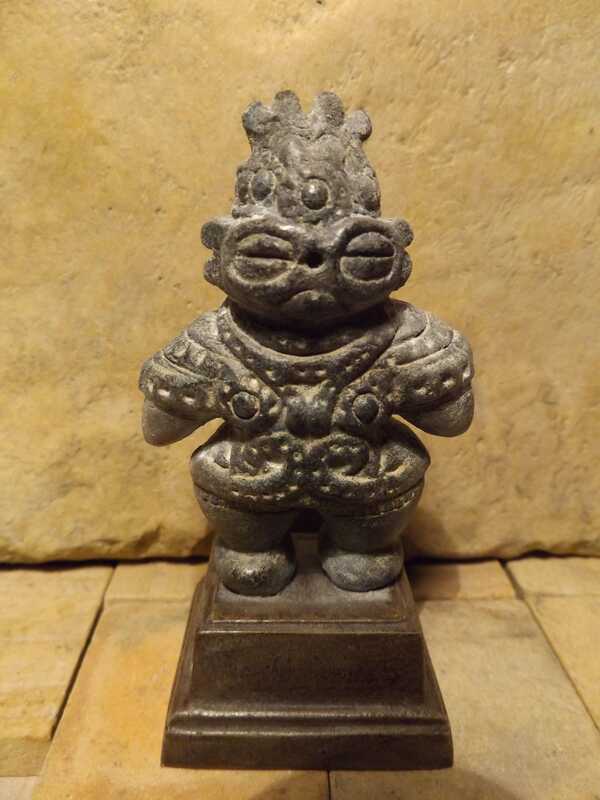 These statues have gained notoriety after the publication and subsequent documentary entitled, 'Chariots of the gods' based on Eric Von Daniken's hypothesis that these statues represent Alien contact in ancient times. Another book - 'The 6000 year old space suit' also a pioneering study that explores the possibility of ancient cultural evidence of Alien imagery in ancient artifacts. Certainly the large eyes and small mouth evoke the modern concept of an Alien being wearing what has been described as an elaborate space suit with goggles and breathing apparatus. 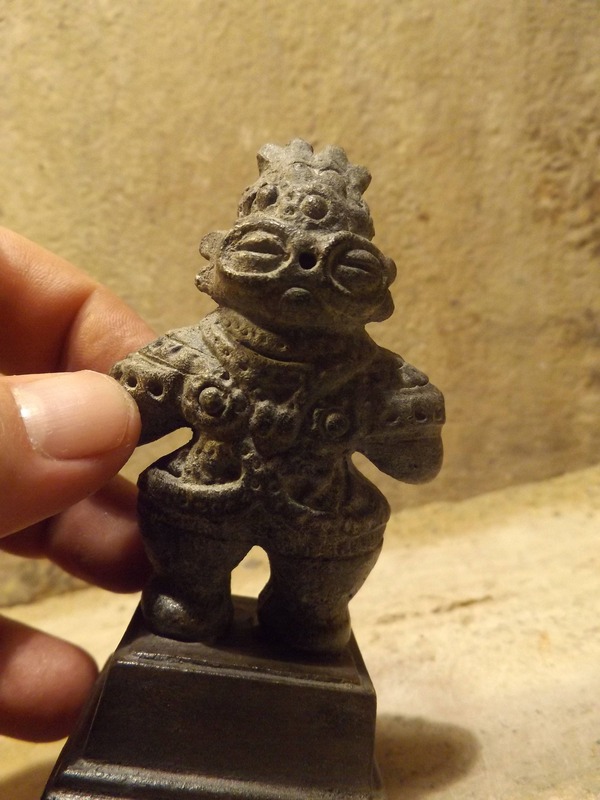 The archaeological assessment is far less fanciful as the discovery of over 15,000 examples have shown that intact statues are rare. 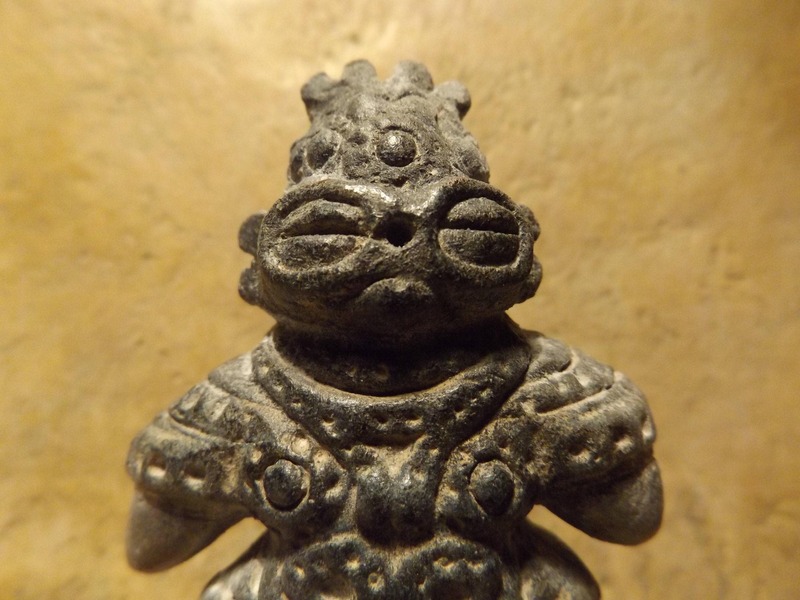 Suggestions that they were fertility images is a common assumption due to so many cultures that formed the feminine 'mother goddess' image from prehistoric times. 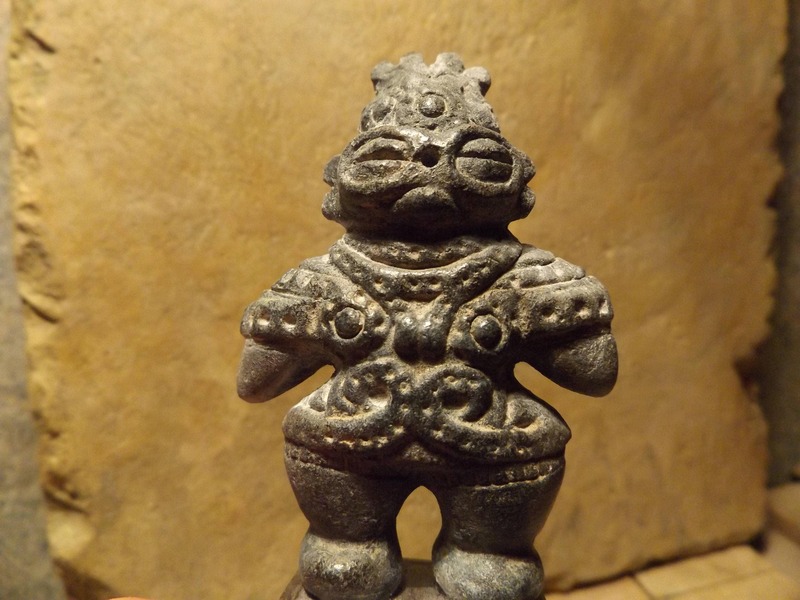 This example does appear to have breasts and wide hips typical of the goddess form. The patterns and bulky look of the costume could represent a type of ancient Eskimo style of clothing needed for the cold climate of ancient Japan. Another hypothesis is based on the obvious dismemberment of the majority of the statues. 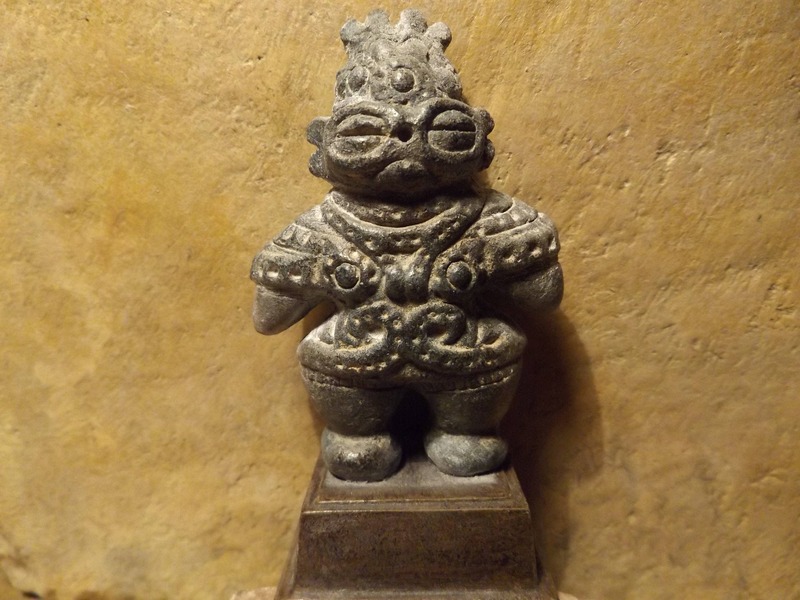 It is thought that they were made as a type of voodoo doll where a personal ailment was focused upon and the statue would take it over and then be smashed releasing the complaint. 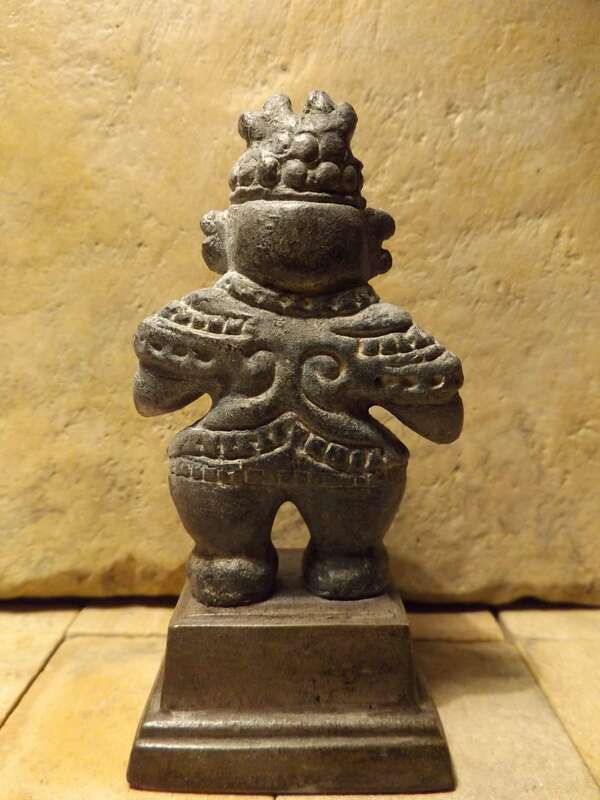 Whatever the statues represent they are one of the most fascinating of ancient sculptures. This piece is a fine example with great fine detail. Made of a limestone and quartzite composition stone it has an aged slate black patina and is mounted on a polished felt based stand.